I wrote an article for New Matilda. 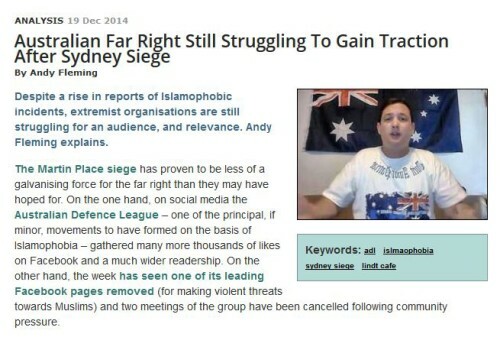 Note that another Islamophobic organisation, the Patriots Defence League Australia, is meeting in Geelong on Sunday at the Rippleside Park Motor Inn. This entry was posted in Anti-fascism, State / Politics and tagged Islamophobia, Martin Fletcher, Martin Place, new matilda, Nicholas Folkes, Nicholas Hunter Folkes, Nick Folkes, Party for Freedom. Bookmark the permalink. Would never of happened in West Virginia where potential victims are armed. Young men in Guy Fawkes (a Catholic terrorist) masks are now saying to us here in Oz..
Wrong Twitter account for Ralph.